Bizet's Carmen Suite has been arranged for cello octet by Carsten Jaspert, German-born cellist of the NDR Radiophilharmonie in Hannover and former Principal Cellist of the Folkwang Kammerorchester in Essen. Outside of his orchestral career, Jaspert has been a member of the Helian Quartet since 2005 and regularly writes arrangements for cello ensembles. I’ve chosen three movements of the Orchestra-Suites and the aria of Don José "La fleur que tu m’avais jeté". The first movement is the Prélude to the opera, the second starts with a small introduction containing a motive of the transition to the first act of the opera and leads into the aria as a solo for the first cello. It could be helpful for the accompanying parts (cellos 2-8) to play this movement with mutes. The third movement is a kind of intermezzo: the Entr’acte between second and third act of the opera, and the fourth movement is the famous Chanson Bohême. 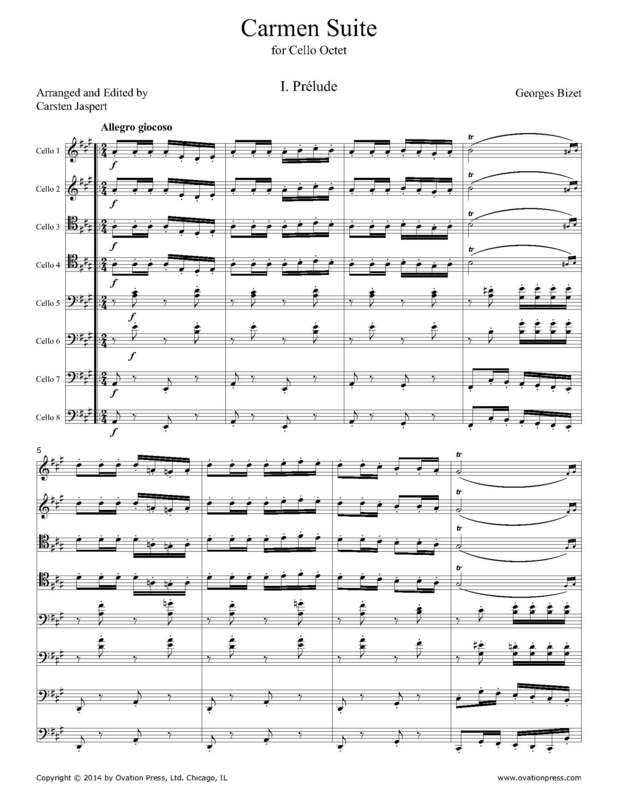 Download and print the score today to gain access to this expertly edited arrangement of Bizet's Carmen Suite for cello octet by Carsten Jaspert! remained with me in my prison. and at night I saw you. to put you in my path. to see you again, Carmen, yes, to see you again! and I was utterly yours.